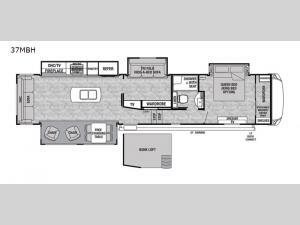 With two bedrooms plus a loft your whole family will enjoy their next camping trip in style and comfort with this quad slide out Cedar Creek Silverback fifth wheel 37MBH by Forest River. Come kick back and relax in the rear living area. You can easily watch TV at the 50” LED TV, plus below there is an electric fireplace. Fixing meals for your family is a breeze in this kitchen. You will find an island with a double sink and plenty of amenities such as a 18 cu. ft. stainless steel electric refrigerator, a spacious pantry, a three burner range, and a 30” over the range microwave. Just off of the kitchen is the bunk room where you can easily sleep two people. In the hallway at the top of the stairs there is another set of steps which leads to the loft which will be a fun hang out spot for your kids. When mom and dad are ready to turn in for the night come do so on the Denver 8" queen mattress in the front private bedroom. There is also plenty of storage space with a dresser and a large front wardrobe, plus so much more! With any Forest River Cedar Creek Silverback Edition fifth wheel you will find Congoleum carefree flooring throughout and in the dining slide there is Shaw carpeting. The kitchen has everything that you would expect to find at home and more from the Furrion chef's kitchen with a gas cooktop, and full panel backsplash, to the 18 cu. ft. stainless steel electric refrigerator with inverter, you won’t be disappointed! The 36" electric fireplace, the Jensen 12 volt CD/DVD/AM/FM/MP3/USB stereo system with a smart control app and Bluetooth, and the 50" LED TV with a swing arm in the living room are sure to be crowd pleasers! Each fifth wheel is constructed with Cedar Creek's famous all aluminum super-structure with a radius wrap metal skirt, and a Z-frame. Plus each comes with a Dexter safety and performance package which includes Dexter axles/brakes/suspension, and a Dexter E-Z flex rubber equalization system with bronze bushings and six greased zer. You are sure to love camping in any one of these Forest River Cedar Creek Silverback fifth wheels so come choose your favorite one today!